September 21, 2012 by LindaJoy Rose . Posted in " Health, Nutrition, Raw Fusion Solution, Snacks, Tips & Tricks, Weight Loss " . Tags " brain boosters, cashews, fast healthy snacks, nutritional yeast, raw cashews, raw snacks, snacks that improve memory, thiamine " . 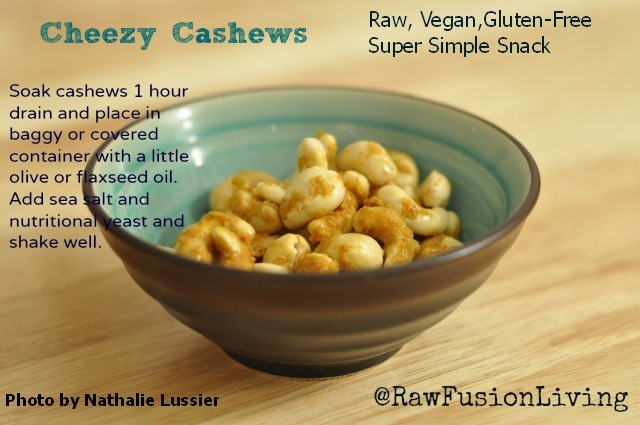 Raw cashews are brain boosters. They contain thiamine, which enhances memory — similar to the herb gingko biloba. Nutritional yeast is loaded with B vitamins, including B12 which is harder for vegans and vegetarians to source. It has a very delightful, cheese-like flavor and also works well on air-popped corn and pasta or spiralized zucchini dishes. I add it to soup and blended salad smoothies. 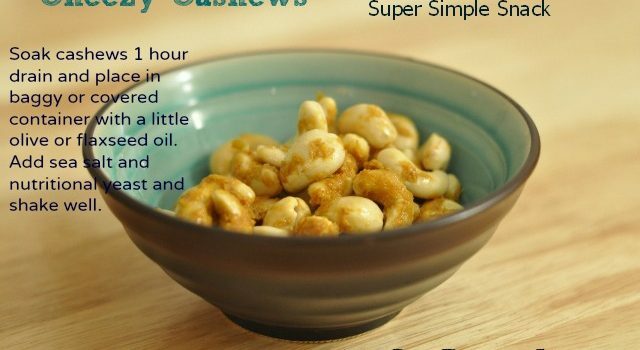 This snack takes only moments to prepare (aside from soaking the cashews for 1 hour to soften them slightly – be careful not to oversoak — 2 hours maximum.) Carry these to work with you or to have after a workout. Remember, when you take a few extra minutes to prepare these healthy snacks, you are less vulnerable to fast food and packaged, processed snacks from convenience stores. For daily tips, techniques and tools and recipes for body, mind and spirit, visit our Facebook Fan page! In "Condiments, Main Meals, Miscellaneous, Raw Fusion Solution, Recipes, Snacks, Tips & Tricks"